I am the first one to create big elaborate layouts with lots of colours and action going on. It is my “wheelhouse”, my happy place so to speak. Every once in a while I like to keep it simple and go neutral. This project is one such piece. I took a cream card stock tag to start as my base. 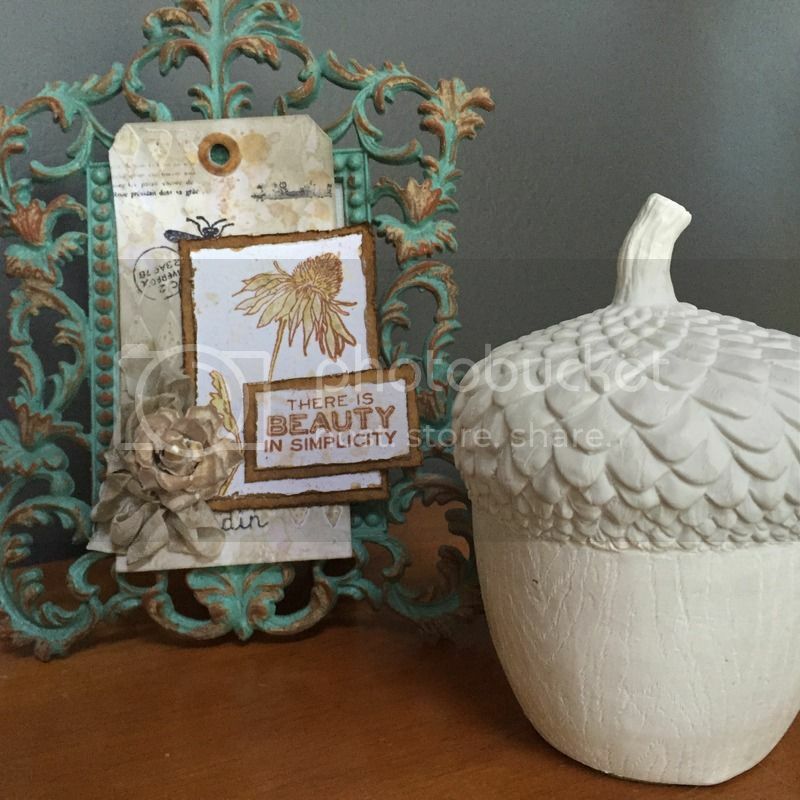 I used Ranger’s texture paste with a Crafter’s workshop harlequin stencil. I applied the paste using an offset spatula that I got from the store. It made applying the medium very easy. They are all sold out of the store but if you want one I am sure Lori could order you one in. I distressed the tag with pumice stone distress ink. Have I mentioned it is my go to distress ink. It is a soft subtle colour. I randomly stamped around the tag keeping in mind where the flower layer was going to to. 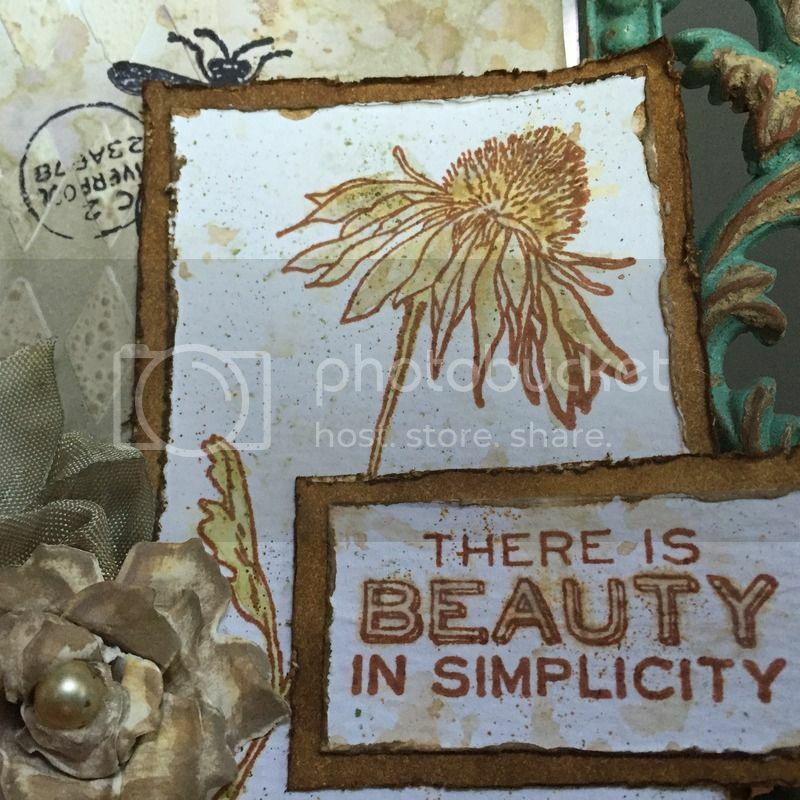 The flower layer is stamped on water colour paper with sepia archival ink and a stamp from the Tim Holtz flower garden stamp set. Archival ink is very important to use for stamping on this project as it is permanent ink. I water coloured the images with a combination of distress inks and the new distress crayons. Let me stop right here and tell you how fun the distress crayons are to use. I scribbled a bit on my craft mat and picked up the colour with a damp water colour brush. If the brush is too wet, the colour of the crayon gets washed out. I just dabbed my brush on a piece of paper towel and tried to pick up the colour again and it worked perfectly. You will see that the rusty hinge crayon was used as accent colour on the centre of the flower and various spots on the petals. Peeled paint crayon was used for the stem and the leaf. The distress crayons were very easy to use. They can be used in many ways (just type in distress crayon in youtube and Mr Tim Holtz himself has videos there on various ways to use them) I am excited to tell you to keep an eye on the store for the distress crayons. They will be coming in soon and I am thinking they will sell out quite quickly. 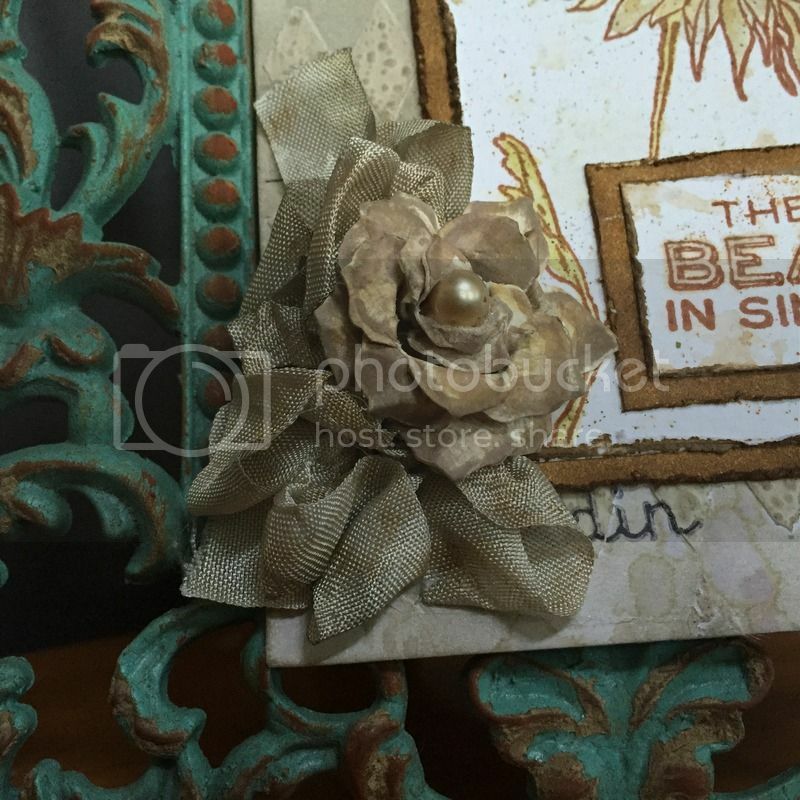 When the stamped image was dry, I used the Tim Holtz marker spritzer to add those subtle dots. I used gathered twigs and pumice stone markers in this step. I flicked watered down colours across the layer and as a final step I flicked plain water droplets on the layer just to get some visual interest. I created the flower using the tattered pinecone die. The ribbon was custom dyed using the pumice stone distress marker along the edge of the ribbon and then spritzing it using a mini spritzer. I also sprayed the ribbon with the marker spritzer. I hope you like my tag and I hope it inspires you just a little. Jennifer I love your tag and the colours are great especially that pumice stone !!! I really like the flower you made and the ribbon !